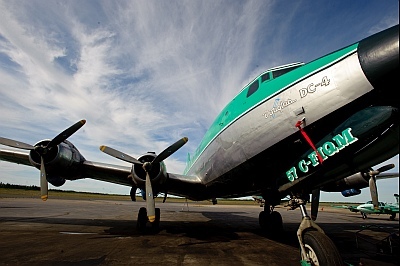 Our guest this episode is Mikey McBryan from Buffalo Airways and the TV show Ice Pilots (known as Ice Pilots NWT in Canada). In the U.S., thie show airs Fridays at 10pm ET/PT on the National Geographic Channel. You can follow them on Twitter at @IcePilotsNWT. In this weeks Across the Pond segment, Pieter Johnson talks with Peter Vojinovic from the Tango Six Blog. This entry was posted in Episodes and tagged A320NEO, ATC, Boeing, C-46, DC-3, DC-4, helicopter, L39, Republic Airways, stealth, Tiger Airways, US Airways, Virgin Australia on May 10, 2011 by maxflight. Great POD cast with Mickey, reminded me of when I lived and worked in a hangar in the Australian outback, so many years ago. Things used to go pear shaped at times as we worked 20 hours a day to get the Bell 47’s ready for the mustering season. It was very hot and humid which caused some frayed nerves to show. Mostly though, we all got on and did our jobs as we were a tight bunch. There are many stories and many things that remain in my heart. Flying is a great thing, living it is greater. Great interview with Mikey Mcbryan. I enjoyed the interview with Mikey McBryan. I discovered Ice Pilots on TV just a few weeks ago and have only watched 2 episodes. It seems to share the rather inane narrative so common in ‘reality’ TV. But I can forgive a lot for the chance to watch those wonderful, old airplanes – and there’s always the mute button! 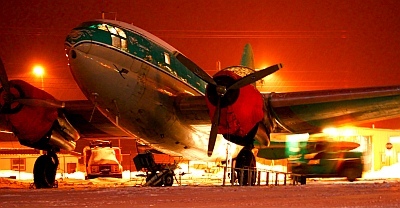 The first episode I watched included a brief scene, featuring a new pilot’s first landing in a DC-4. The instructor’s calm, careful coaching was entirely authentic and I felt lucky to be there watching. After landing, the new pilot reached for the handle to raise the flaps and got his hand slapped by his instructor. The instructor chucked, and apologetically explained that he wanted to make sure the new guy didn’t raise gear. You can’t fake that sort of thing. Good stuff: I’ll be tuning in again. 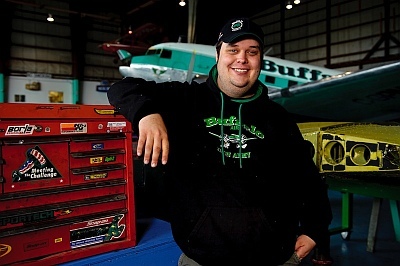 Really loved the interview with Mikey from Buffalo Airways. Of course I also watch the show on TV here in Australia. I was interested to hear Mikey discuss the camera men and how they reduced the number of people filming, partly to fit them in the Aircraft and partly to “keep it real” and not to create scenes, rather to film existing real life scenes. Thanks, Carlos, and all the others who gave us good feedback on this episode and others. While we do have fun doing this podcast, it’s quite a lot of work to produce. Getting great guests is really rewarding, and we get to “meet” some fascinating people. But our listeners are just as fantastic – thanks for listening!